"Martin repaved two parking lots for us, and did a fantastic job. One of them in particular was a tricky job with very specific sloping needs. He gave us an expert assessment of the lot, and what the best option was going to be for managing water drainage. Working with Martin was an absolute breeze. I will absolutely contact him again for any work that’s in his wheelhouse." "Great Job! Fast and professional!" "We had a drive way put in everything went as planned." "Fast, nice, easy to work with, on time and actually came back to do some touch-up work. We originally only wanted ¾ of our lot paved but found out how beautiful job they were doing and then we decided while they were here to do the entire lot. They accommodated our request THAT DAY!! And got it done! McNally’s pricing was very competitive and they had no problem with meeting us on the job site a couple of times to go over exactly what we needed done. Great company and would use them again!" "Good about making and keeping appointment times provided service according to agreed upon estimate"
"I used McNally and I would recommend him. The work was completed on time and was professionally done." "Family owned company that does what they say they will do. Super job on my asphalt driveway. Very understanding to the needs of you the customer. Ethical, precise and very competitive pricing. 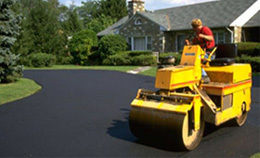 I would recommend Asphalt Paving Co.(the McNallys) over any other company -100% job well done!" "He was courteous, did the job as stated and charged the fee agreed upon. The work was excellent." "Great price next day service good work"
"The work was done as agreed, owner of the company was very cooperative in helping to get a plan with the neighbor that all could agree on"
"Driveway repair/reseal was completed as planned. They were very quick to respond to my inquiry, gave me a satisfactory price and got the job done. Very pleased. They called the next day to see if everything was ok"
"Prompt and cordial service. Excellent work at a good price. Recommended."